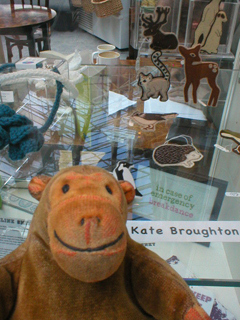 "They're very precise little birds and beasts"
Mr Monkey inspected the small animal and bird badges made by Kate Broughton. He was surprised and impressed to see how many different materials she used, and how subtle the colours were. 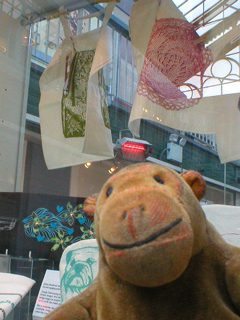 Looking at the top of the display case Mr Monkey examined bags by Showpony (Emma Henderson). 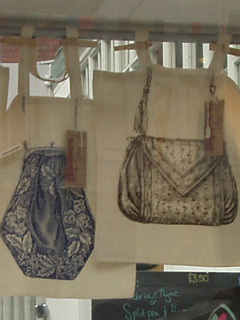 These are brand new bags, cunningly printed with pictures so that people who've inadvertently got too much stuff to fit in their vintage handbags can carry it stylishly. 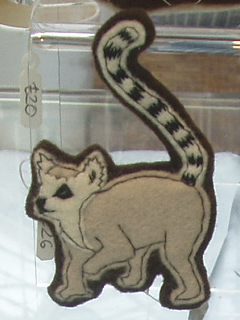 You can read about the artists at the Kate Broughton website and the Showpony website.